The holidays are fast approaching, well I guess you can they have arrived. Halloween is behind us and Thanksgiving, Christmas, and New Years are right around the corner. 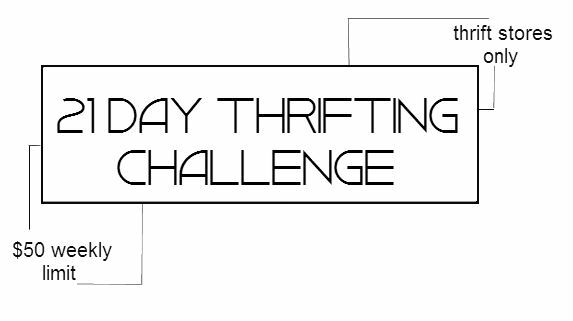 Inspired by this bloggers 356 day thrifting challenge, I've decided to give my wallet a little R&R by going on a 21 day thrifting challenge. I am not allowed to buy any clothing items, outside of lingerie and shapewear, from places other than thrift stores. So outwear, shoes, accessories, pants, dresses, you get the idea, must all be thrifted. To make things even more frugal, I can only spend no more than $50 a week. Honestly I aim to spend even less per week, but you never know when you might come across that to die for shoe or gorgeous vintage bauble. Each week I will post my finds and amount spent. If all goes well, I just might extend the challenge on into December. Wish me luck!! Is anyone else interested in doing a thrifting challenge or have already done one. Please let me know.